The zone of overlap between two popular, closely related backyard birds is moving northward at a rate that matches warming winter temperatures, according to a study by researchers from the Cornell Lab of Ornithology, Villanova University, and Cornell University. The research will be published online in Current Biology on Thursday, March 6, 2014. 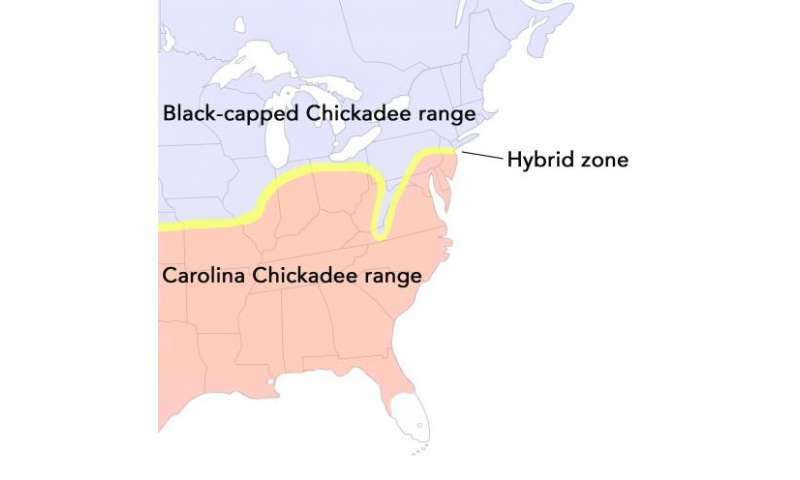 In a narrow strip that runs across the eastern U.S., Carolina Chickadees from the south meet and interbreed with Black-capped Chickadees from the north. The new study finds that this hybrid zone has moved northward at a rate of 0.7 mile per year over the last decade. That's fast enough that the researchers had to add an extra study site partway through their project in order to keep up. "A lot of the time climate change doesn't really seem tangible," said lead author Scott Taylor, a postdoctoral researcher at the Cornell Lab of Ornithology. "But here are these common little backyard birds we all grew up with, and we're seeing them moving northward on relatively short time scales." "Hybridization is kind of a brick wall between these two species," said Robert Curry, a professor of biology at Villanova University, who led the field component of the study. "Carolina Chickadees can't blithely disperse north without running into black-caps and creating hybrids. That makes it possible to keep an eye on the hybrid zone and see exactly how the ranges are shifting." The researchers drew on field studies, genetic analyses, and crowdsourced bird sightings. First, detailed observations and banding data from sites arrayed across the hybrid zone provided a basic record of how quickly the zone moved. Next, genetic analyses revealed in unprecedented detail the degree to which hybrids shared the DNA of both parent species. And then crowdsourced data drawn from eBird, a citizen-science project run by the Cornell Lab, allowed the researchers to expand the scale of the study and match bird observations with winter temperatures. The researchers analyzed blood samples from 167 chickadees—83 collected in 2000–2002 and 84 in 2010–2012. Using next-generation genetic sequencing, they looked at more than 1,400 fragments of the birds' genomes to see how much was Black-capped Chickadee DNA and how much was Carolina. The site that had been in the middle of the hybrid zone at the start of the study was almost pure Carolina Chickadees by the end. The next site to the north, which Curry and his students had originally picked as a stronghold of Black-capped Chickadees, had become dominated by hybrids. Female Carolina Chickadees seem to be leading the charge, Curry said. Field observations show that females move on average about 0.6 mile between where they're born and where they settle down. That's about twice as far as males and almost exactly as fast as the hybrid zone is moving. As a final step, the researchers overlaid temperature records on eBird sightings of hybrid chickadees. They found a very close match: hybrids occurred only in areas where the average winter low temperature was between 14 and 20 degrees Fahrenheit. They also used eBird records to estimate where the hybrid zone had been a decade earlier, and found the same relationship with temperature existed then, too. The only difference was that those temperatures had shifted to the north by about seven miles since 2000. Chickadees—there are seven species in North America—are fixtures in most of the backyards of the continent. These tiny, fluffy birds with bold black-and-white faces are favorite year-round visitors to bird feeders, somehow surviving cold winters despite weighing less than half an ounce. To the untrained eye the Carolina Chickadee of the southeastern U.S. is almost identical to the more northern Black-capped Chickadee—although the Carolina has a shorter tail, less white on its shoulders, and a song of four notes instead of two notes. Genetic research indicates the two have been distinct species for at least 2.5 million years. "The rapidity with which these changes are happening is a big deal," Taylor said. "If we can see it happening with chickadees, which are pretty mobile, we should think more closely about what's happening to other species. Small mammals, insects, and definitely plants are probably feeling these same pressures—they're just not as able to move in response." An cold winter does not disrupt the overall trend. Give it a few more years, then come back and see what's occurring. All I asked was for winter of '13-'14 data. Obviously it will not be collected. The data for the report spans only two 2-year intervals. Is there any other interpretation for the data or just your pet theory? Real scientists do not demean any question about their studies.